In contrast, the braids in the photo above are braided on one, tightly packed layer, not two. They’re flat, but fairly thick, and have bumpy ridges in shallow V-shapes along the length of the braid. 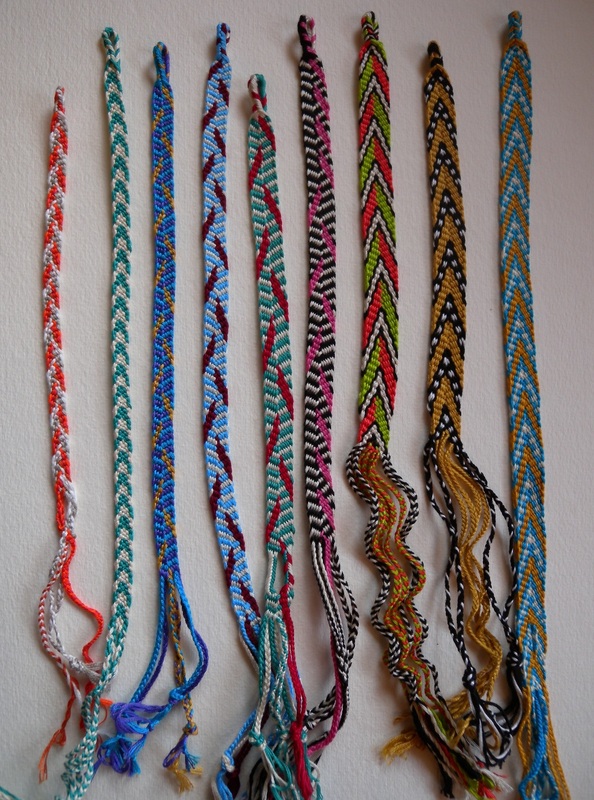 They look similar to the braids that were often called “bends” or “chevrons” in the old loop braiding manuscripts. Those braids are also repp braids, but of twining rather than plain-weave. 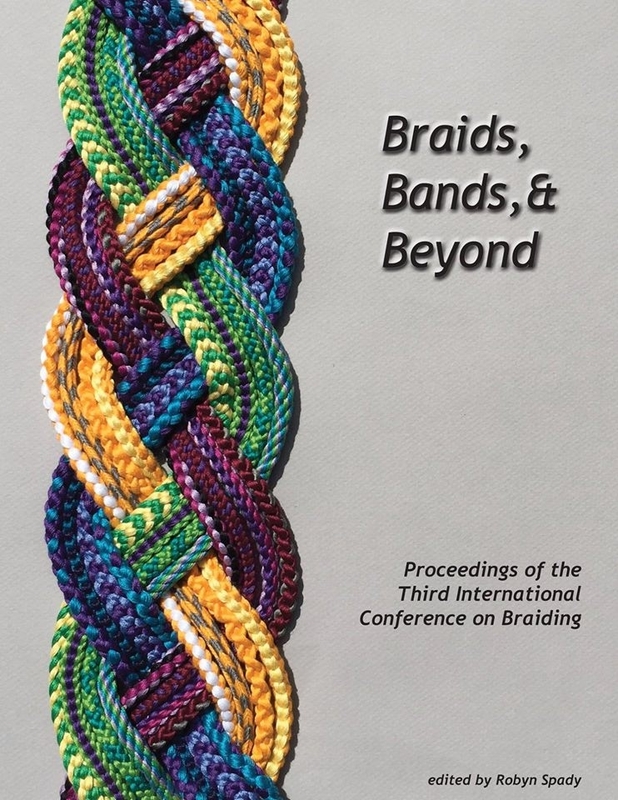 (examples of medieval “bend” and “chevron” braids are in last sections of Cindy Myers’ chart called Fingerloop Braids by Type. …including the way 9 loops (or more) are handled. There’s just one extra “twist” to the method when making one of these plain-weave braids. See the last footnote in my Terminology page. By the way, the curly-looking fringes of some of the braids in the photo are 2-loop braids—2 loops makes a small, flat, 4-strand braid with an intrinsic twist. I have more than one video tutorial for 2-loop braids hiding down at the bottom of my Tutorials index page. (Lefties would make this braid differently than righties, and it’s easier to use your whole hand rather than fingers with longer loops.) It’s an extremely easy braid, though it’s tricky at first to get an even tension. But once you make a few, you’ll get the hang of how to control the tension. The curliness itself might seem ‘wonky’ at first, but to me that’s a feature, not a problem! 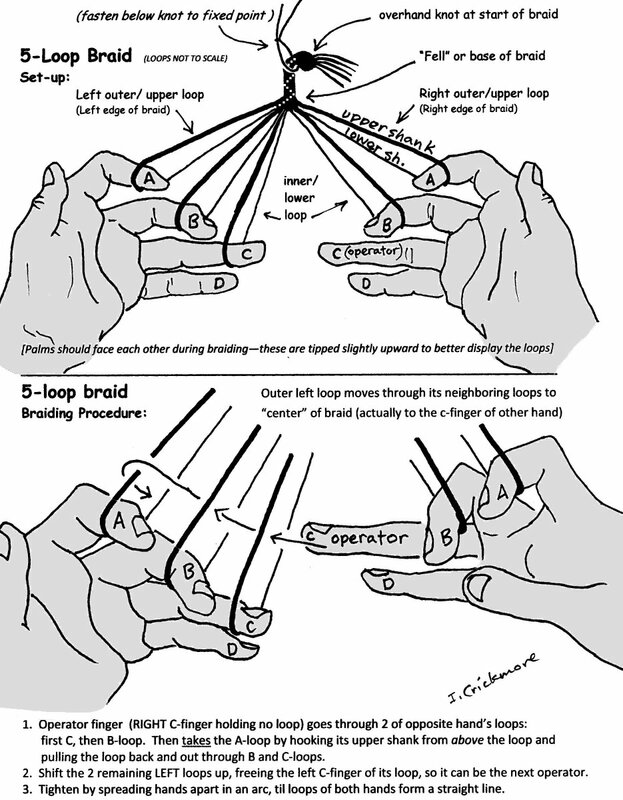 Ingrid, I happened upon a photo of loop braiding and fell in love with it. Thanks so much for all of your help and inspiration! What an awesome artform. You rock! Thank you! I hope you keep having fun with it! Your braids are georgeous, I’m quite inspired although currently caught in crochet eddy. On backburner is need for braided binding (to sew on) for cardigan (Christmas present). I bought cone of lovely, fine rayon, (approx. equiv. to size 8 perle cotton) which I think will be perfect: has sheen but not as shiny as the DMC rayon embroidery thread, not too slippery and just a bit of body-slightly stiff but still supple, however not nearly as supple as standard cotton embroidery thread. To my eye this yarn looks better for this application than a comparable nylon, plus round nylon yarn tends to stay round and I think this rayon will flatten out. The braids available at the sewing stores are just awful–medium sized acrylic yarn in very loose simple flat braid, and expensive too boot. They are too bulky, appropriate for heavy felted wool or canvas coats or blankets. I know this is not as nearly as interesting as your multi-color, multi-stitch braids, but would you be willing to apply your considerable experience and suggest a braid pattern for this application? It needs to be about 5/8″-3/4″ in width, (5/16″ -3/8″ after folding), I plan to sew the braid on by catching each yarn as it folds on the edge of braid and sewing (or crocheting) to the face of the sweater then wrap over edge and blind stitch to back side. My biggest concern is the need for maximum flexibility going around 90 degree curves to avoid puckers. It might work better if it is more flexible/supple in the center than on the edges, if that is even possible, and this is why I ask for your opinion rather than just proceed with a ‘plain flat braid’. I think it needs to be fairly flat (thin in height) so that when folded in half the double thickness is not too bulky for the medium weight double knit, and for the same reason I believe it should not be too tightly woven in order to follow the drape of the knit and to not make the edge too stiff. A hollow braid, while sturdier and perhaps more attractive, would probably end up being too bulky, but I bow to your greater knowledge. It could have a doubled (raised) or decorative center line to help make it want to fold in half and to provide a sturdier, (perhaps squared? ), more durable leading edge (after folding). I have some bobbins to help control the considerable length of each yarn since I’m hoping to have surround the entire piece with just one splice. Any help you could offer would be greatly appreciated. For some reason, even though I haven’t done that much braiding, (just a bit here and there for fun or short samples to try out a various designs), I’m fairly confident I’ll be able to do this after a short practice period, & I have plenty of yarn to practice with. Hi Melanie, your yarn sounds beautiful, but it’s on the fine side for getting the width that you want, even doubled. The main issue is length, though – bobbins just don’t work for loop braiding. Up to almost twice your arm length is the most that is straightforward and easy to achieve, if you start braiding from the center point of your loops, instead of from an end point. See my post on Longer Loop Braids for some other ideas. Very long braids can be made with loop braiding, but it’s a lot to start out with! If the length is very important and you don’t want to deal with loop braiding workarounds, you might want to look into kumihimo braiding. Bobbins and long lengths say “kumihimo” to me! Other than those concerns, a flat braid sounds perfect. I suggest starting with the 5-loop square braid, then its flat variation, and practicing that until the moves feel natural. Then go up to a 7-loop square braid and its flat variation. Once you’ve learned those, both the “Spanish” braid of 7 loops and the double braids of 6, 8, and 10 loops (more complex braids) also have flat variations that would tend to be wider than flat “square” braids. (see my Tutorials index page.) Good luck and let me know if you have any more questions, either here or through my email ‘contact’ form (tab in top menu). Hi Leigh, thanks for the note! Happy braiding!